The World Health Organization (WHO) now states there are almost 2,000 suspected cases - significantly higher than the 1,309 it reported last Thursday and is now officially the worst outbreak in over 50 years. 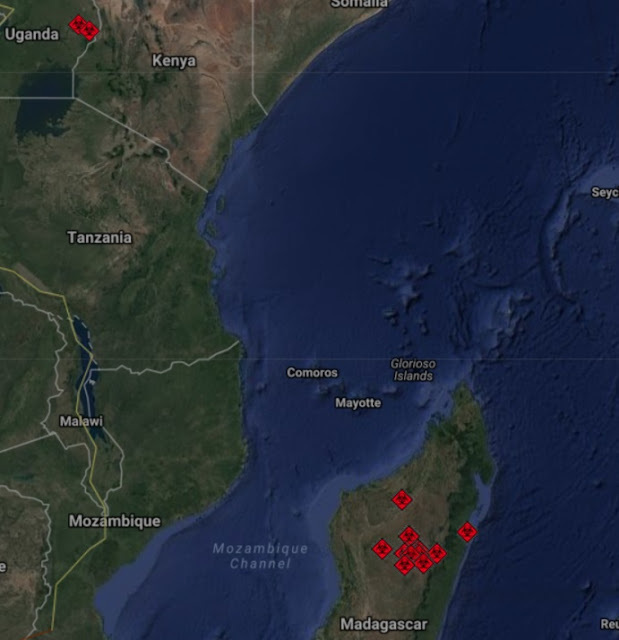 In an update on the plague outbreak in Madagascar, UN officials now put the ever-changing case tally in the epidemic that began on August 1 at 1,947 confirmed, probable and suspected cases of plague through Nov. 3. Of these, 1,437 (74%) were clinically classified as pulmonary plague, 295 (15%) were bubonic plague, one was septicemic, and 211 were not yet classified (further classification of cases is in the process). Officials have been saying recently that the number of new cases of pulmonary plague is declining across the country. However, while the decline in the incidence is encouraging, more cases of plague are expected to be reported in Madagascar until the typical plague season ends in April 2018. To that effect, sustaining ongoing operations during the outbreak and through the plague season is crucial to minimize the current human-to-human transmission of pneumonic plague and the bubonic plague infections. The key control measures that need to continue to the end of April 2018 include active case finding and treatment, comprehensive contact identification, follow-up and antibiotic treatment, rodent and flea control, and safe and dignified burials. Uganda's health ministry yesterday confirmed a second fatal Marburg virus case, involving the 38-year-old brother of the country's first lab-confirmed case-patient. The Marburg virus has more than a 90% fatality rate and there is no known cure. Also, health officials reported another suspected case and a new probable case, both of whom are isolated and in stable condition. The man, who is from Kween district, is listed as Uganda's second confirmed case and is the brother of both the woman listed as the first lab-confirmed case and a man who died from similar symptoms but, because no samples were taken, is listed as a probable case. According to earlier reports, the 38-year-old brother had driven his sister to the hospital, where she died from her Marburg infection. Given the man's connections to his sick sister and brother, the health ministry listed him as a high-risk contact, but he went into hiding and refused evaluation and follow-up, despite several attempts from surveillance teams. On Oct 24, he agreed to speak with a contact tracer, who determined the man had Marburg symptoms, and he was taken to an isolation centre with fever, weakness, abdominal pain, appetite loss, joint pain, and a history of vomiting blood. Despite treatment, he died from his infection yesterday, and his blood sample tested positive for Marburg virus in tests done at the Uganda Virus Research Center. The health ministry said a 25-year-old woman from neighbouring Kapchorwa district sought evaluation for Marburg-like symptoms and was isolated, where medical staff collected a blood sample. Another test revealed that she is pregnant. Uganda's health ministry has classified her illness as a suspected case. Also, the ministry announced a new probable case, a 23-year-old man from Kapchorwa district who had shared a hospital ward and had a bed next to one of the confirmed cases. The patient has been placed in isolation, and his test results are expected today. Overall, the health ministry has recorded two confirmed, four suspected, and three probable cases. Earlier tests have ruled out six Marburg infections, including in two health workers. As of yesterday, health officials are monitoring 130 contacts, an increase of 25 from the day before.